The all mahogany soprano doesn't get a fancy inlay. It's destined for the raffle at Hollesley (inshallah) so I lack a name of the future owner and I did want a clean minimalist look so mother of pearl shards were out too. But it will get frets (I have a cunning plan for a uke without fretwire but that'll require an ebony fretboard). 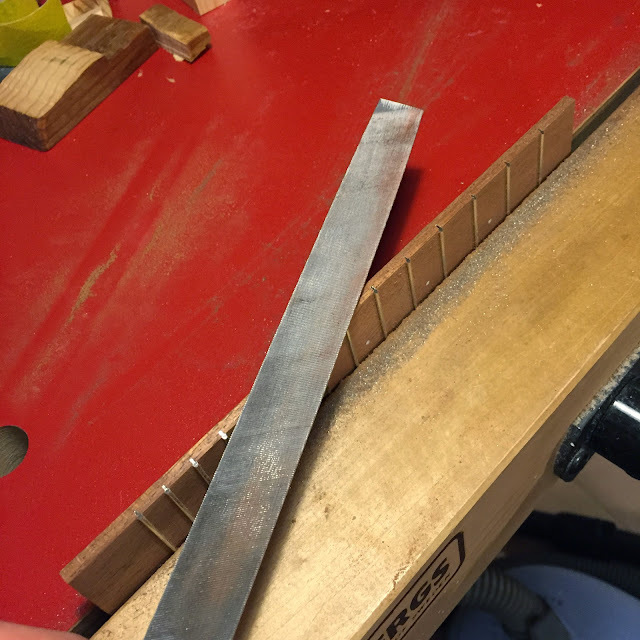 So, first step is drawing a triangular needle file along each slot to knock the edges off. 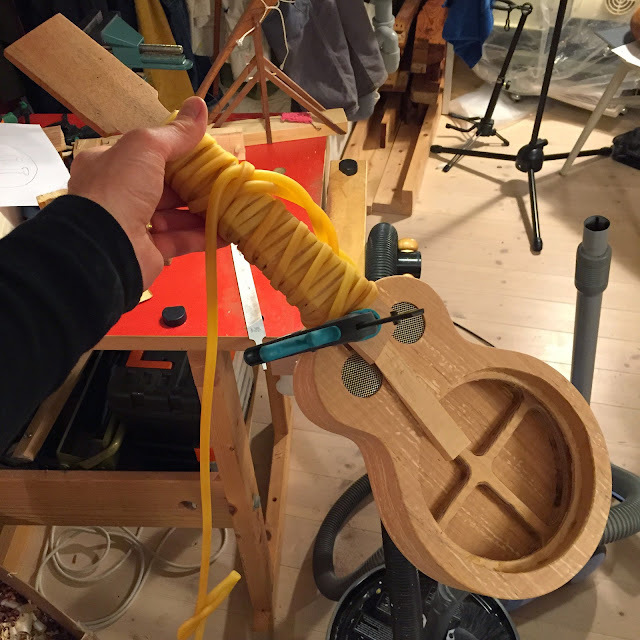 This will let the frets be seated both easier and better. 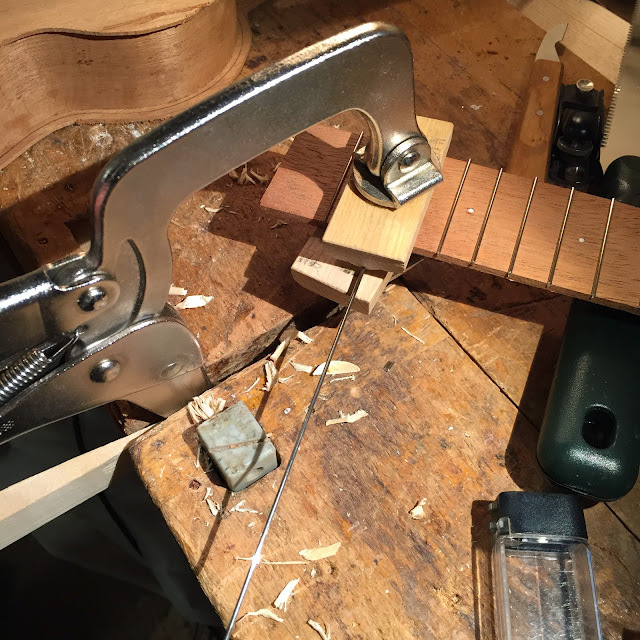 With my jerry rigged fret press I press the fretwire down, cutting the length off after each slot is taken care of. Then I clamp the board in a wooden vise and use a single cut file to get all the ends down to the edge of the board. I think the technique is called draw filing and it is faster than the way I did it before; dragging the fretted board across a sanding board. 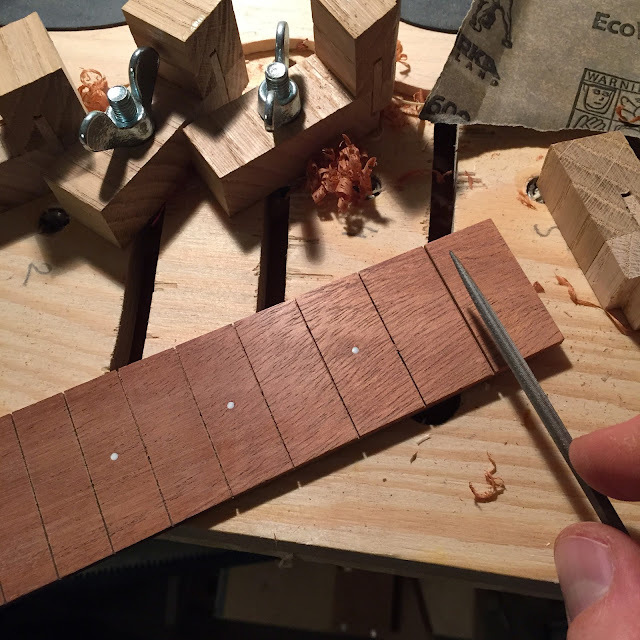 It's important to keep the pressure on the file uneven, more is required at the high end where there are more frets. Clamping with a rubber hose, easy and a lot more fun than clamps. And we're only in this for the fun, remember? Drugs and money seem scarce. A maple caul with grooves for the frets keeps the pressure on the fretboard rather than on the frets. The only downside to the hose is it presses out, smears and distributes excess glue so I had a lot of cleaning up to do. Ideally I would have removed the hose after an hour, cleaned the glue before it set hard, and then put the hose back on. But by the time that first hour had passed I was at the office. But they're good now. 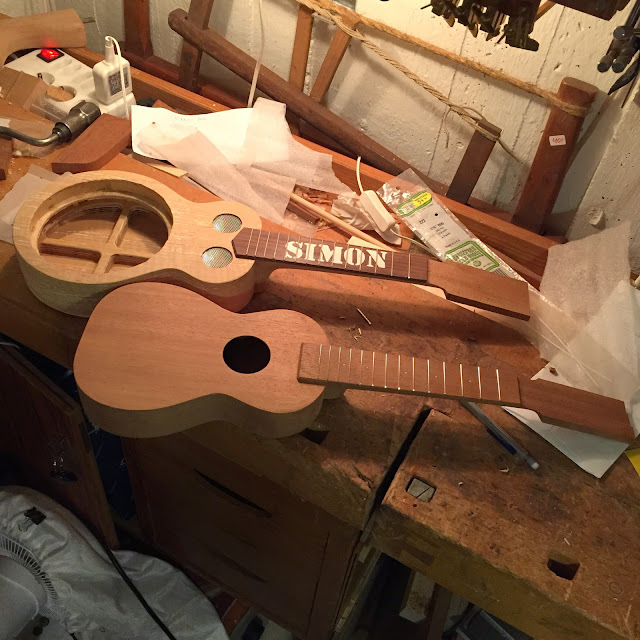 Next up is holes for tuners, a bridge for the acoustic, and then finishing with shellac.